We have worked with a variety of technologies in our lives. Please have a look at what we can offer. Our goal is to be unbureaucratic and to help you out FAST. No long negotiations, contracts or handling time. Woboq's main background is from inside Qt development (formerly by Trolltech/Nokia/Digia, now The Qt Company). Now in 2017, Woboq still has a very good relationship with the Qt people and is actively contributing to Qt. 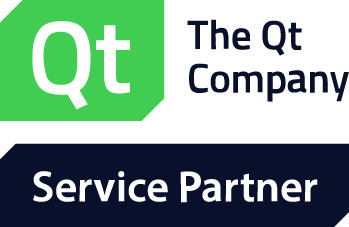 We have worked on Qt itself for many years, with contribution everywhere within Qt, such as in QtCore, QtWidgets, QML/Quick or QtWebKit/QtWebEngine. We are interested in supporting you in projects related to all major Qt areas (desktop, iOS, Android, embedded). We can help you in all phases of your development cycle, from the architecture design to the actual implementation and debugging. Applications performance is often the number 1 problem. Does your Qt application require optimisations? We have experience in all areas, from graphics/OpenGL to network, from mobile to embedded to desktop. We can profile your software and will then help you to make run it smoothly. You can hire Woboq to fix the Qt bugs you want to see fixed, or implement new features inside Qt. Send us an email with the bug number or a description of your feature, and we will reply with a quote. Often it is easier to have someone guiding you instead of trying to find out everything yourself. If your team spends a lot of time using Qt, we are ready to support you when you most need it. You can get help via e-mail, IM or voice call. You can ask us for help with hard to track down issues. If your team needs any support in using Qt, we are happy to help you. We are happy to give you a more informal Q&A-style training "Ask an expert". Please contact us if you are interested in engaging us for a project. Depending on the project we can work remotely or on-site.